August 31, 2018 at 12:05a.m. 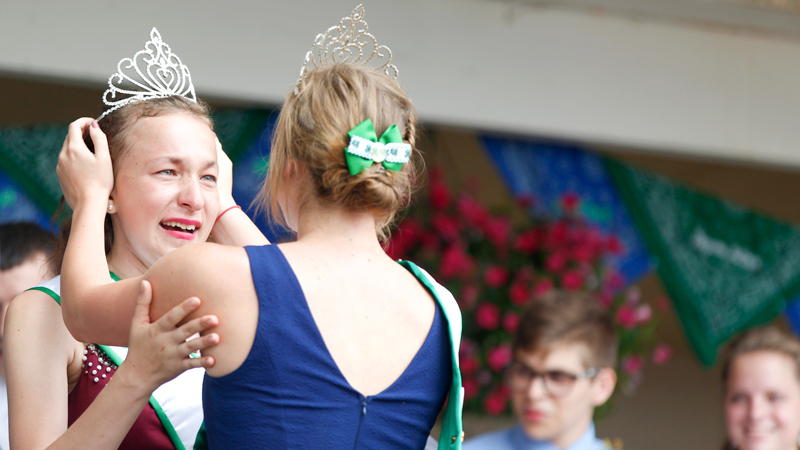 When Callia Barwick heard her name announced as 4-H queen at the Canfield Fair on Thursday, it was the culmination of a lifelong dream. Making the honor all the more special is the fact that her counterpart, the 4-H king, is a lifelong friend. Matthew Fetty, a senior at Canfield, was selected as king. The two were recognized along with the 10 other members of the 4-H royal court during Thursday’s Junior Fair Youth Day program. The program also recognized Junior Fair Outstanding Youth, several local 4-H clubs and numerous scholarship recipients. The male Outstanding Youth winner for 2018 is James Moore, the son of James Moore and Mary Meloga of Canfield. Moore, a South Range High School senior, is a Boy Scout representative for Outstanding Youth and a member of the Mahoning County Junior Fair board. The female Outstanding Youth winner is Brittany Siembida, daughter of John and Mindy Siembida. Brittany, a freshman at Kent State University, is a member of Millcreek My-T-Mites 4-H Club and a member of Mahoning County Junior Fair board. Fetty, the son of Lisa Fetty, is a member of the Youngstown Tailwaggers 4-H Club, for which he focuses on showing dogs. He’s been involved in 4-H for 12 years. “I couldn’t believe it. I worked so hard for it and it finally happened,” he said. Barwick, the daughter of Madonna Barwick, is a member of the Steel Valley K-9 4-H Club and has been involved in 4-H for 12 years. Her project areas include dogs, horses, veterinary science, leadership, writing and more. As 4-H king and queen, Fetty and Barwick will travel to fairs around the state. They’re ready to go. “I’m excited to see this year out and help benefit 4-H,” Barwick said. August 30, 2018 3:42 p.m.
August 31, 2017 10:55 p.m.
September 1, 2017 12:01 a.m.